December 18, 2012 by Venky. As the distant mist was gliding over the verdant hills, and the chirpy birds began to spread their wings, a couple of us sat in the portico taking in the beauty of it all along with our breakfast. If I can freeze the beauty of those moments and take them back with me to replay every morning wherever I am, wouldn’t it be perfect? But I guess, like so many other moments on TFN, these moments feel so special because they are so rare. After a great breakfast we got ready to take a bus ride till Gonikoppal to avoid riding through the terribly patchy roads or the non-existent roads rather. Our bikes were already packed and shifted to the start point. We started our bumpy ride around 8:30amin a TATA Winger. The original route that we were supposed to ride is so bumpy that even our driver was scared to go that way and took us via an alternate route that was a lot better but which was very narrow. We had to spend 30-40mins struck in a huge traffic jam caused by hundreds of vehicles on that route near a temple ferrying thousands of people for some festivities. Even then we were the first vehicle to reach Gonikoppal around 10:30 am since all other vehicles took the original much bumpier ride route. 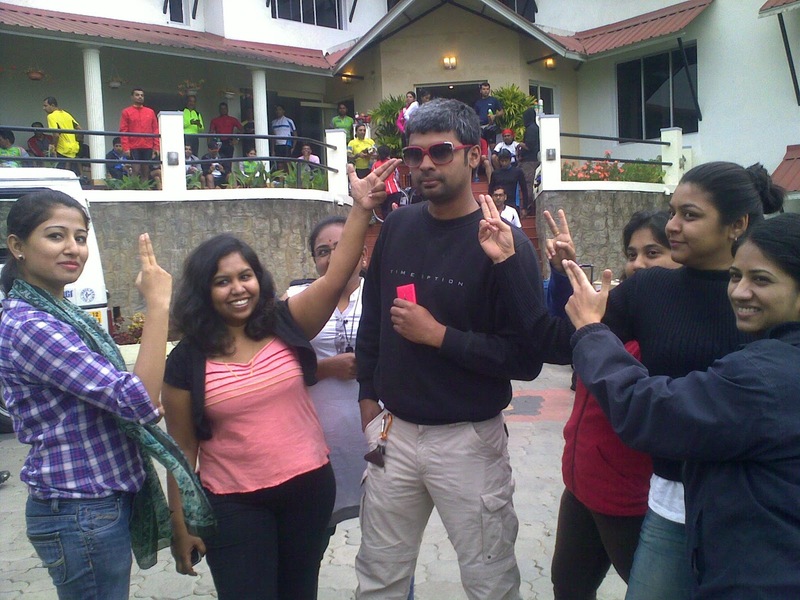 The handsome tour director with his staff… On a fun filled day! We unpacked our bikes and got ready to roll. 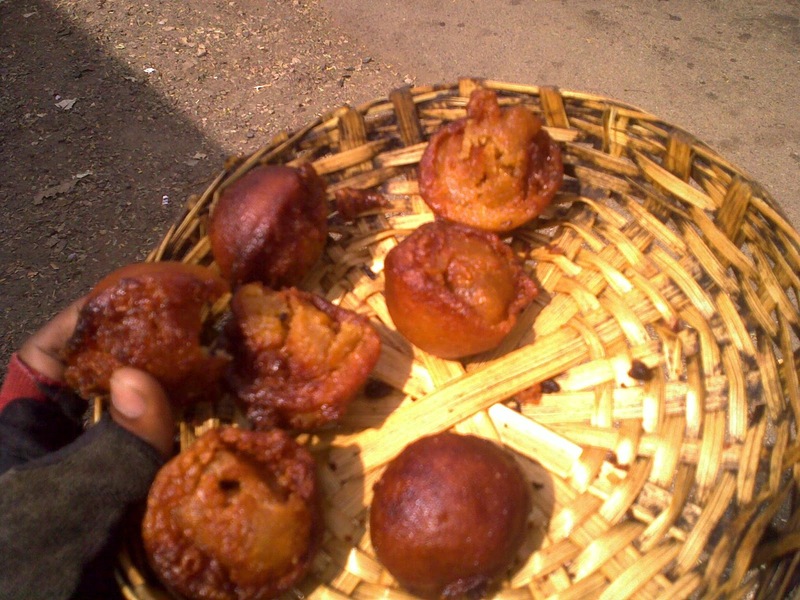 But before we started, we didn’t want to miss one of those local delicacies that we discovered during our recce. 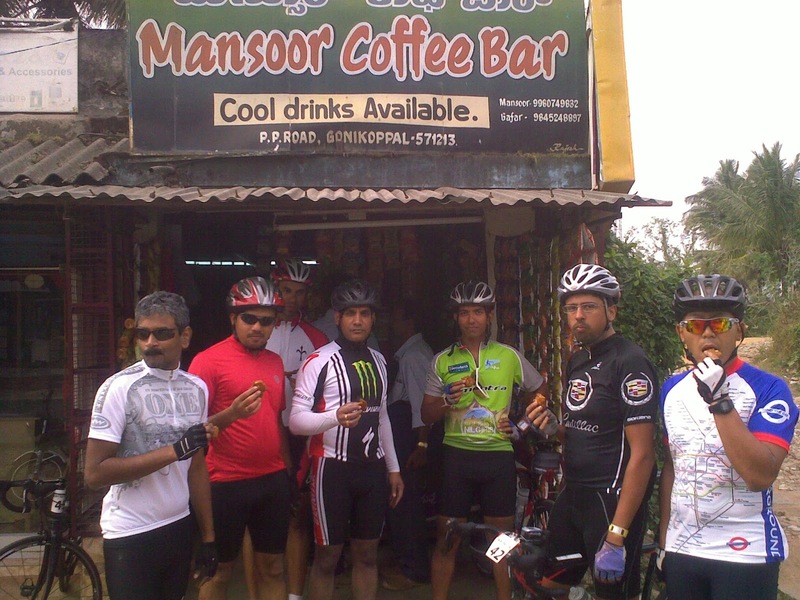 We raided the Mansoor Coffee ‘Bar’ and finished off the delicious tasting peanut cookies there. As we’ve started riding out of Gonikoppal, I ended up behind Richard McDowell and Naveen John(NJ) who were riding at front and were seriously discussing power figures from yesterday’s climb and other technical mumbo jumbo. After a while NJ seems to have realized that riding with Richard could jeopardize his recovery ride and slowly dropped back to ride with his team director, Vivek Radhakrishnan. Richard and I kept going chatting about various rides and our ride partners during our riding days together in Hyderabad. It was good fun going down the memory lane with him. But trying to keep up with that guy even when he was casually chatting along is not so much fun. “TEA”FNers attacking all the local food joints as they ride along..
After the support station one, we descended through a beautiful forest reserve to arrive at the much anticipated unniappam and lemon tea shop. The place was full of TFNers and I think most of them didn’t stop at one unniappam, that simple and yet delicious kerala sweet made of rice flour. The black tea was equally good. After stress testing his supply chain to the maximum, we slowly began to ride again. After brief stops at the next couple of support stations we were eager to get to the hotel quickly as it turned out to be quite a long day even with an actual ride of just under 100km. As we entered Kerala, Vivek revealed that the actual purpose of him joining the ride was to find NJ a bride who could cook him nice beef fry and offer him her tender coconut love. NJ even tried sprucing up his malayali vocabulary a bit with a crash course from Dipankar who apparently studied in a mallu college for three years. While we were having fun imitating various accents and going through crash courses in multiple languages, we were climbing considerable short wall like climbs and finally reached Sultan Bhatery. As we entered the town, NJ’s friend and college mate from US, Derek Jan Laan, wondered why would someone name a place ‘Salt ‘n Bakery’! Oh well..
Ashwin Bhatia, an entrepreneur and professor from Noida, was going through a tough phase in life and needed a challenge big enough to focus on to bring his life back into focus. He chose the Tour of Niligirs as that challenge, registered for it and began to train for it. 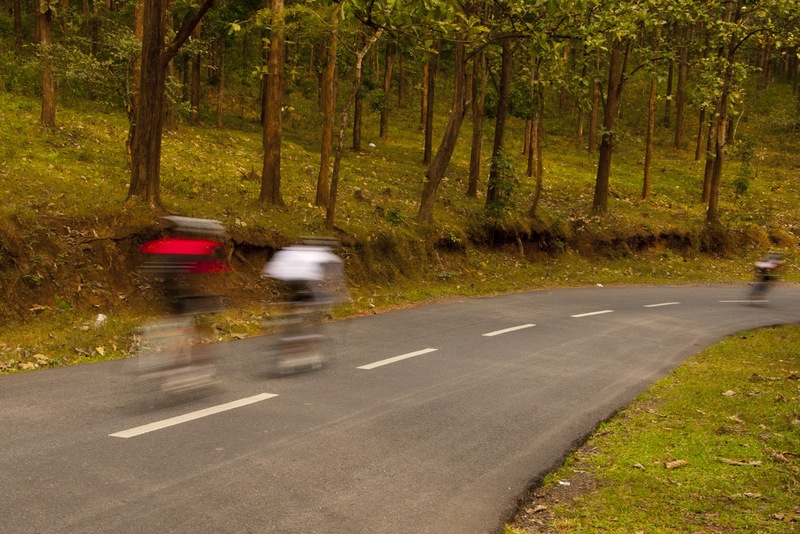 During one of those training rides he met a fellow rider Usha Prasad and they began to ride together often. They became friends and subsequently much more than friends. When Ashwin proposed to Usha, she had a bucket list of items which her future partner has to agree to help her achieve in order for her to answer in affirmative. First on that list was TFN-2013 followed by similarly challenging things like riding up Kardung La etc. He not only agreed to all of those conditions but also convinced her to ride the TFN this year with him when he came to know that a couple of slots from riders who dropped out at last minute were available. Despite her initial apprehensions about her ability to complete the tour on her MTB, she said yes because it involved three things that she loves most- riding her bike, spending time with him and realizing her dream of riding the Tour of Nilgiris. Usha says that tour feels like a cycling pilgrimage and that they will come together and ride again next year. She intends to ride TFN-2013 on her road bike along with Ashwin. Ashwin says, “I thought that during the tough times a challenge like TFN would give me a life again. But I never thought it would end up giving me a wife too!” Ashwin and Usha are going to get married soon after TFN. All the best in the tour and the longer journey together guys! There was no competitive section today. We fooled around a lot and had loads of fun trying out local delicacies and riding through beautiful scenery. Still it was a tough ride with considerable amount of climbing despite the fact that it was cut short by 45km of bad roads. Considering the fact that tomorrow is going to be an even tougher day with the 21km Ootyclimb as competitive section, a lot of experienced riders including NJ were taking it very easy. But a few inexperienced and over enthusiastic souls were spending a lot of energy unnecessarily racing on today’s climbs. They could be ruing it when they begin to feel the effects in their legs tomorrow. Also read: Tomorrow’s stage preview. It's a pleasure to read the blog Venky. Way to go! As usual nice read……Tfn is not only famous for climbs also for some very yummy yummy foods.